HiMolde students visiting Geirangerfjorden and Trollstigen share their experiences. 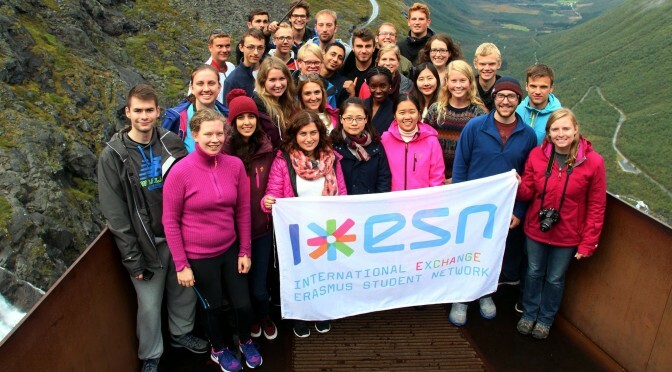 Last weekend 29 students of HiMolde – including nine students visiting from Oslo and Trondheim – explored the beauty of Geirangerfjorden and Trollstigen on a trip organised by ESN Molde. The Geiranger fjord – a World Heritage Site – is a unique and exceptionally beautiful landscape created by Mother Nature. Trollstigen mountain road, meanwhile, is a testimony to superb engineering and construction skills of humans. Tourists from all over the world consider both Geirangerfjorden and Trollstigen as must-see attractions when visiting Norway. Everyone we asked agreed that kayaking was the most memorable activity. «You don’t need to be expert in it. There were a couple of times when we stopped paddling and just stayed in the middle of the water. It was so still and quiet with just the faintest sounds of the waterfalls in a perfect landscape. A wonderful experience to create a contact between the person and the nature. A fjord is not a place, but a feeling that you won’t really believe until you’ve experienced it,» said Anna Caterina Salatto, an exchange student from Italy. The waterfall is quite close to Hole Cabins. Storseterfossen is an interesting attraction because it cannot be seen on a cruise of Geirangerfjorden. You have to hike to explore it, which already made it stand out compared to the other waterfalls easily seen on the cruise. Hanna Vrst, an exchange student from Germany, said the experience off going behind the 30-meter waterfall was very fascinating. Brit Flemmen Berg, the ESN organiser, also considered to include this waterfall into the next year trip. A cabin at Hole Cabins provides good comfort and you share it with four people. It might be a little small for five people, instead, provided the warm atmosphere. Anna, Hanna, Christoph Scharf- an exchange student from Austria – and Dahye Kang, an exchange student from Korea, asserted that the most intriguing thing of living in cabins was the view from their windows: mountains, the village of Geiranger and the fjord. ESN Molde organised BBQ and games for all participants on Saturday. Fun is the most common comment, but be careful of the cold. Hanna shared that she and her friends did BBQ outside, but ate inside due to the cold weather. Spectacular, intriguing, peaceful, adventurous and fun are words used by the students to describe the trip. Their only advice for you is not forget to bring hiking shoes, warm clothes and raincoats! Forrige innleggTeater om demensNeste innleggForsker-standup: Organdonasjon – angår det deg?